This is my favorite time of year to focus more on myself. Hold up. A mom wanting to take a little time out to focus more on herself…? I promise you that it’s not as selfish as it sounds. In fact, it’s something that moms don’t do nearly enough. You know how your kids need down time or quiet time – maybe even a time out? Sometimes moms need that, too. We’re usually so busy doing it all, so we can ‘have it all,’ that we forget about ourselves. I was recently browsing Amazon, looking for cool, little gifts for my kids and my husband, and I had a thought – what about me? What do I want? When my husband asks me for gift suggestions, I often draw a blank, because I don’t usually have time to think about myself. I may be picky when it comes to gifts, but there are some gift items that are easy to gift, affordable, appreciated and, in my book, no-brainers. Sure, I love clothing, shoes, jewelry and electronics, but those can all be sort of personal and hard to gift without really knowing the person on the receiving end. At different times throughout the year, I love to get a ‘little something special’ as much as the next gal. I also love to show the ladies in my life that they’re valued and appreciated. A go-to gift for me is a nice set of nail polish. It’s useful, affordable, and something that most women use and will enjoy. To take it a step further – I want to share a favorite nail polish of mine with you. It’s not your average nail polish, and it actually does double duty! We’re longtime fans of Del Sol products in my house. Their unique color-changing apparel and accessories are so cool! My husband still has a Del Sol T-shirt that he got when he was a kid – he loves that shirt! 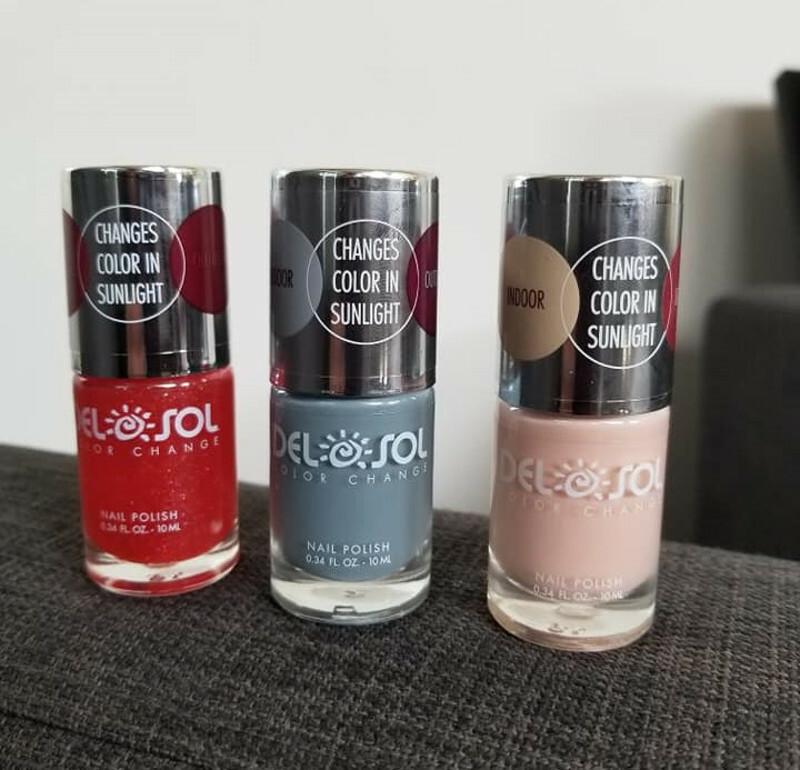 Del Sol even has its own unique line of color-change nail polish! That’s right – it starts out as one color (and stays that color) indoors, and changes color in the sunlight outdoors! I don’t paint my nails super often, but when I do, I love to go with colors that are seasonal and on-trend. In the spring, I love using shades of grey (lighter shades) and light pinks. In fact, those were the colors I chose to use for my baby shower when I was pregnant with S.
I tried out Better Slate Than Never and loved how easily it went on. I didn’t use a base coat, because I wanted to see how the nail polish went on – all on its own. It adhered to my nails very well, though the first coat was very thin. Within about 60 seconds, the first coat was fully dry, and I was able to put on a second coat with no streaking or pulling. I was super pleased with my results and the way the polish looked after two coats, even without a top coat. I used Now You See It on my toenails, and S currently has Liquid Sunshine on her toenails. Now You See It is a really sweet, light color for spring, and Liquid Sunshine is all glitzy and glittery, which S absolutely loves! The best part? Each of these polishes starts out one color when you’re indoors, and then changes color once you step out into the sunlight! From slate to a purplish-red, from light pink to burgundy, and from glittery hot pink to glittery red, these colors will wow your friends and make you smile! The polish wears well, holds up against washing dishes, and day-to-day tasks, which I am very pleased to report. These polishes retail for $10.00/each, and make great gifts! Revised version of this article first appeared on Mommy’s Block Party. Read more from her here.